This is a list of all the boats in our system, ordered by the last time they were updated. You can use the filters below to sort the boats to only what you want. You must log in in order to add a new boat or edit existing ones. 1977 Pioneer 19' jet. Gale Banks design 454 BBC. Lightweight layup, full stringer hull, w/ Kevlar cap. NJBA #365. 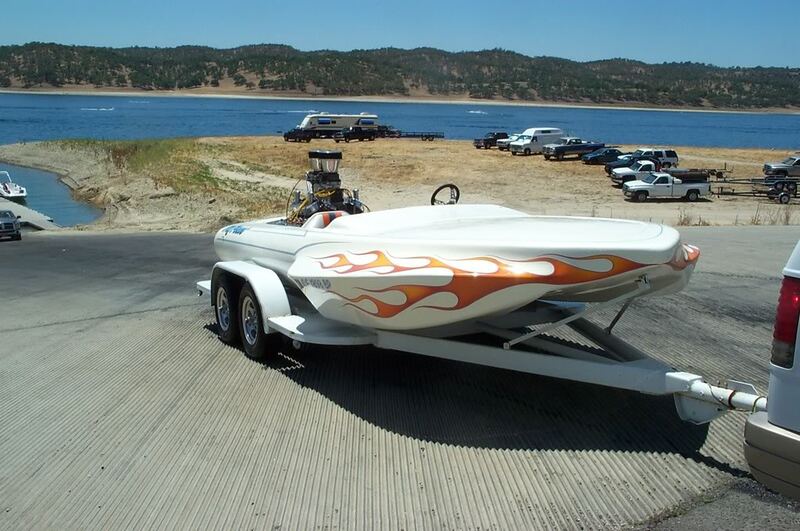 Boat was Danny Gaulach's BAF Alkahauler. Later sold to Jerry Davis raced it as War Party. Blown Alcohol Hydro, class may be wrong. This boat was purchased by Jon and Charlie Sibbach in April 2014, from Shawn ? in Paso Robles, who kept the engine out of the boat. It is currently getting some work done to clean it up and repair some cosmetic defects. A new mild BBC and OTs are planned. It will be a dedicated ski boat. It has a 10 degree split case Casale v-drive with 12% gears, a steel prop, rudder and strut, and a single down pedal setup. It has Teleflex steering rather than cables. It originally had fiberglass tanks but they have been removed in favor of stainless. 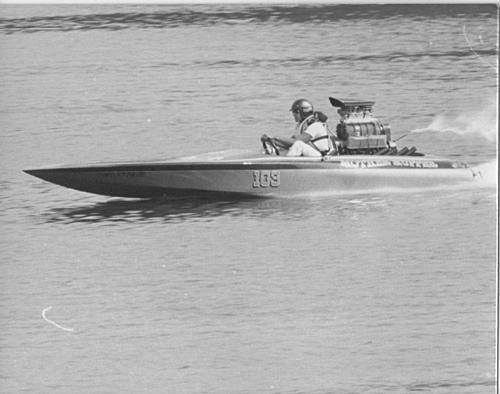 Unblown gas flat, one of the few successful twin-engine boats of the 60s. Stevens hull. On its first run, the rudder failed and the boat with driver Larry Schwabenland went for a wild ride. Larry swam to shore, 3 members of his crew accompanied him back to the pits. Larry drove the next boat through, a flat bottom. I (HARLAN ORRIN) was on shore watching. 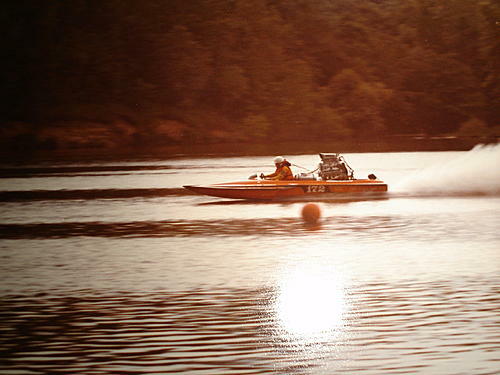 The boat eventually ran over 123 mph. The boat had an experimental dual prop setup. It was eventually destroyed, possibly at Long Beach Marine Stadium. This Hallett wood decker was purchased by Lynn "Pie" Youngs in 1964 and in the water in early 1965. The deck was built by Harlin Orrin. 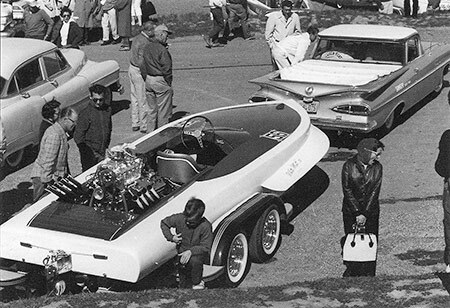 It was powered by a 354" early Hemi, bored .20 over, with a set of "Bill Morse -Dry Stacks" for the exhaust. The interior was done by Jack McNiel of Interiors By Jack. V-drive (22% gears), and powered by a Paul Grichar "finessed" 396 Chevrolet. 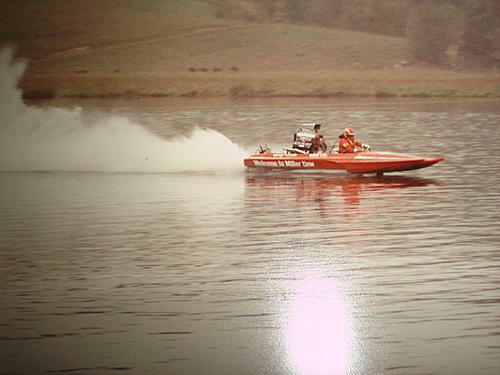 Lynn Youngs owned the boat and hardware and the late Arthur (Bernie) Buck owned the engine. 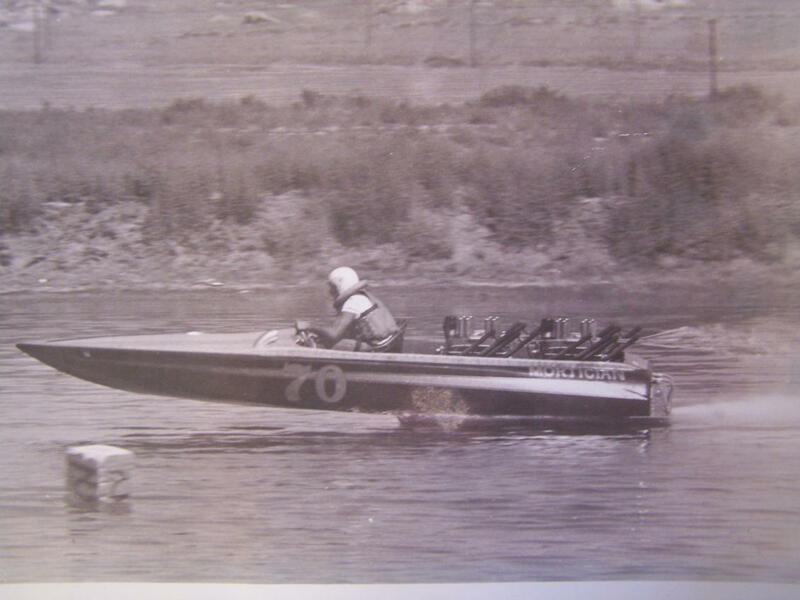 They ran seven Enduros in 1966 and the Catalina Ski Race as well. 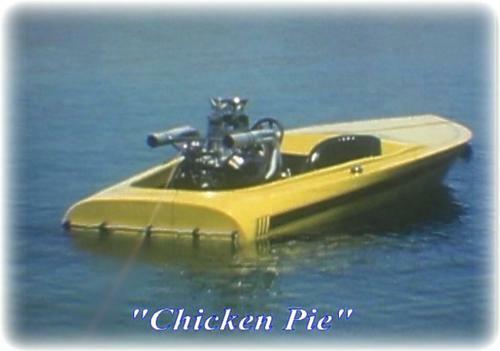 After selling the first Chicken Pie boat, Lynn Youngs purchased this 21' Hallett V-drive day cruiser. It has a 454 Chevy and a Turbo 400 transmission. He still owns the boat as of June 2014. 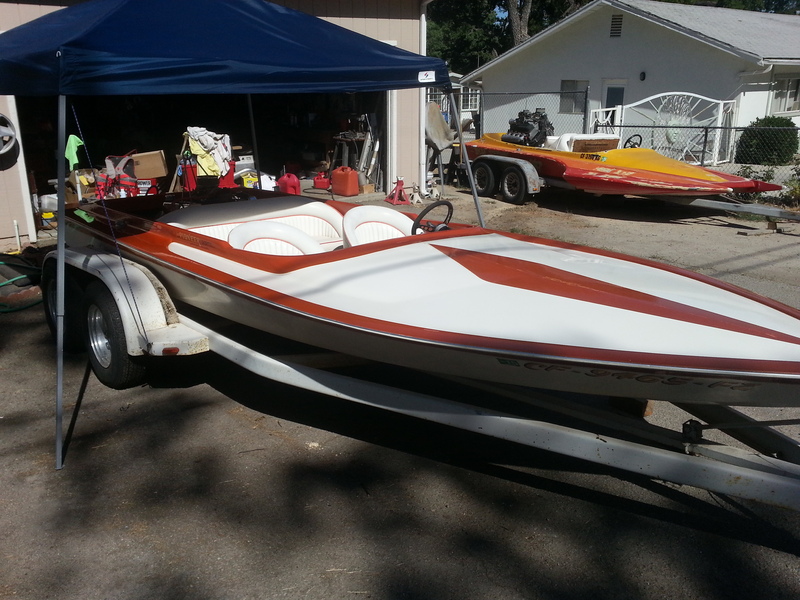 "My Peace" is a 1961 Sanger Ski Hydro. 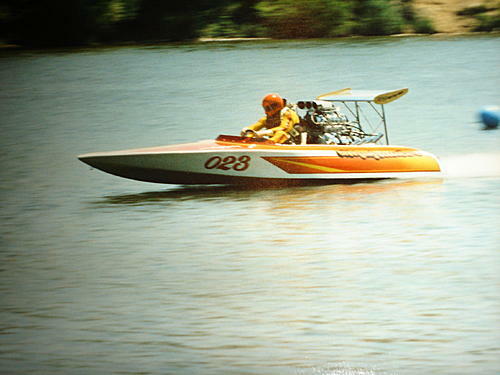 It is one of seven original prototype hydros built by Jack Davidson (Sanger Boats), and a sister boat to White Mist. It was originally sold in Paso Robles, CA, with a Cadillac engine and pearl white color. The second owner was Jerry Wildman, whose father owned the local Cadillac dealership. Jerry replaced the Cad engine with an early 396 big block Chevy. For some time, he ran it with the wrong rudder on it, using a short one from a flatbottom. This would result in the boat turning sideways at 90. 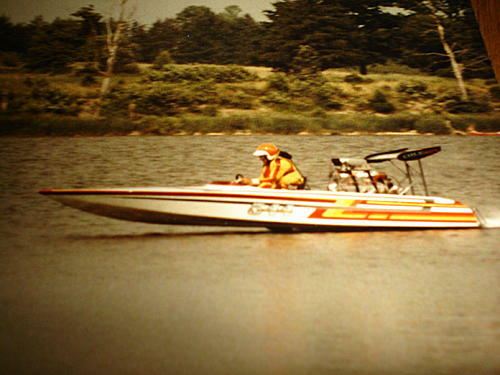 This is the boat that Steve Hall (founder of Pioneer Boats) used for their brochures and marketing materials. 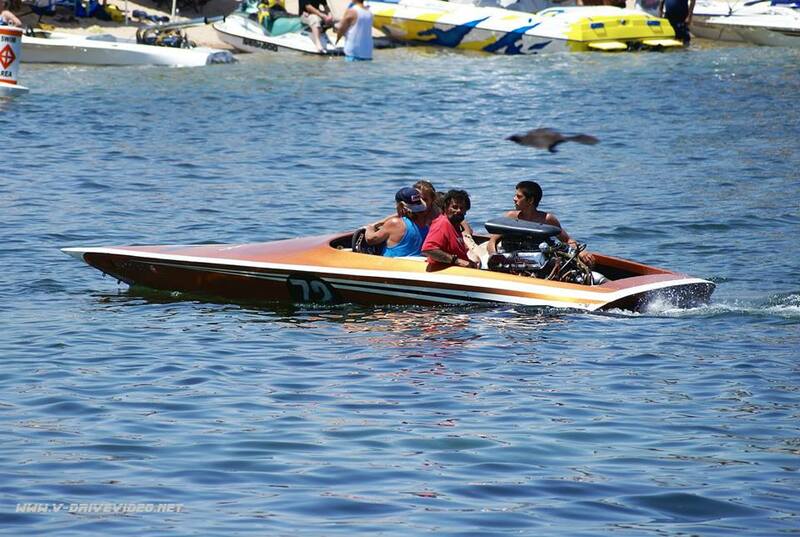 It has a Ford 460" and a Berkely split bowl jet. 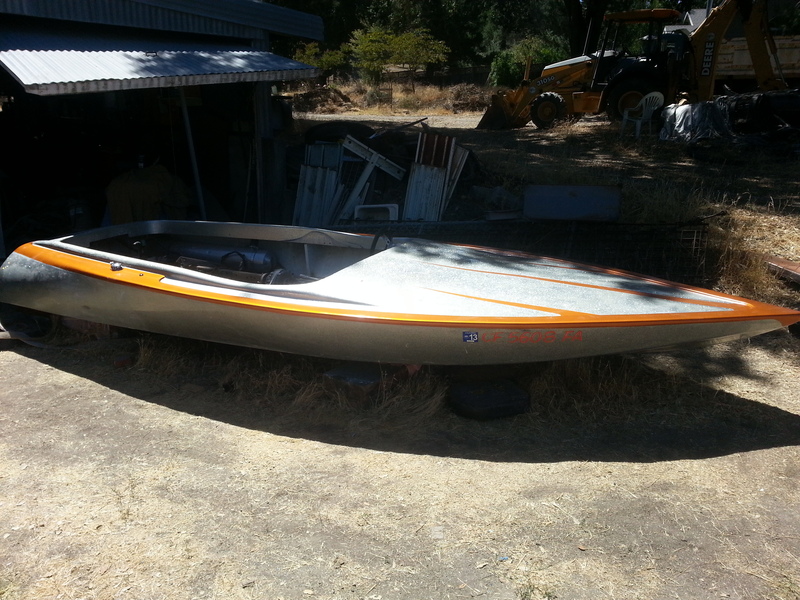 The boat was purchased by Mike Musgjerd in 2014 as a flipper. He went through the boat and fixed numerous small issues. The boat is for sale as of June 2014. 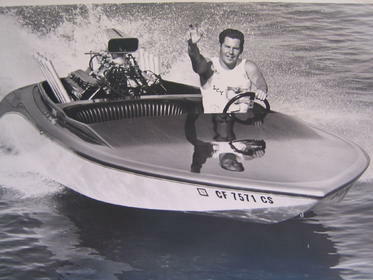 Driven by Garry Brown in the Unblown Gas Flat class at the NDBA's 1973 Drag Boat Grand Prix at Long Beach Marine Stadium on September 29th and 30th. 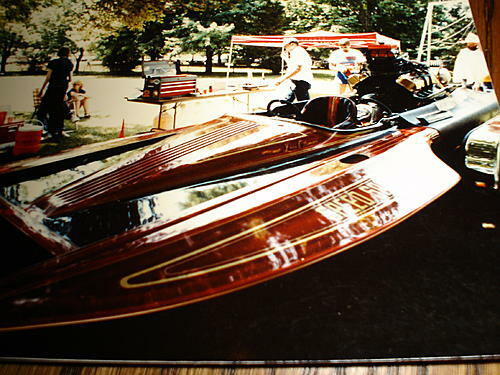 It was a Hondo hull with a 465" Olds engine.